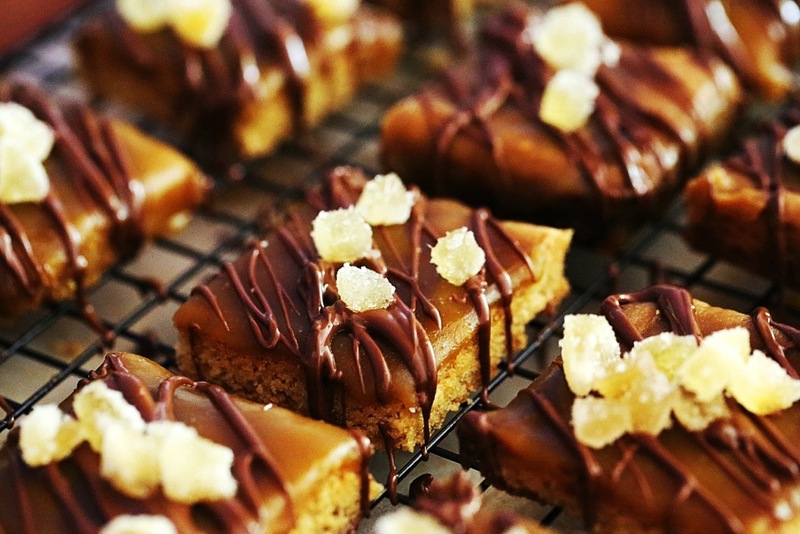 Ginger Crunch is a delicious treat for anyone who loves ginger. While this is a classic New Zealand recipe from Edmonds Cookery Book I came across it from David Lebovitz’s blog. New Zealand is Australia’s closest neighbour and we’re always claiming theirs as ours (Pavlova, Phar Lap and Russell Crowe) so to me it seems odd to be using a New Zealand recipe obtained from an American living in Paris but such is the wonderful way of the internet! It is very reminiscent of homemade slices which I always enjoyed at school fundraisers during my childhood. As I made this slice for a casual stand up drinks and nibbles at a friend’s place I decorated it with a drizzle of melted chocolate and some chopped crystalised ginger in an attempt to make it look a bit more sophisticated. Dark chocolate would have been a better choice as the slice is quite sweet but I simply used some milk chocolate that I had in the pantry. I used 70g (about 2.5oz) and most of it ended up on the slice. I otherwise followed the David’s recipe. What sweets do you take to a party? Posted in Bars, Brownies & SlicesTagged David Lebovitz, food, food photography, ginger, New Zealand, vegetarianBookmark the permalink. Thanks Jennifer. I always welcome anything chocolate! Ooh! I bookmarked his recipe to make soon but I think I like your version even more – that chocolate on top just takes it to the next level! Thank you! It’s also really nice with walnuts on top. I look forward to seeing what you do with it; I really enjoy reading your blog. A very moreish looking slice! Great pic! Thanks! It is very moreish. I’m looking forward to making it again.